What parts of the body does Fraxel treat? Is it right for my skin colour? Fraxel laser rejuvenation is unique in that it can treat women and men of all skin colours and ages. Unlike some other lasers which are only indicated for specific skin types, Fraxel can treat both light and dark skin safely and effectively. What skin concerns does Fraxel treat? What results can I expect from Fraxel? What can I expect during my Fraxel consultation? You will complete one of our Patient Information Forms, and we will ask you some questions about you medical history, previous treatments, lifestyle and skin goals. Fraxel might not be the best treatment for you, and if so, your clinician will suggest an alternative treatment to address your skin concerns, or to help achieve the results you are looking for. Sometimes, one of our other therapies or procedures are more appropriate to achieve your desired outcome. For example, if your primary concern is extensive volume loss in your upper face and associated loose skin in your lower face, while Fraxel will improve your skin condition, making it look more youthful - it will not replace lost fat pads or underlying structures in your face. So your clinician may recommend dermal fillers as an alternative option to address your key concern. 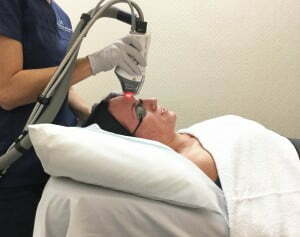 As with all treatments, it is important to have reasonable expectations of what laser therapy can achieve for you. Being realistic about the outcomes you hope to achieve, the time frames within which you expect to see your final result - and understanding the way that laser works will help prepare you for the treatment and a good outcome. What can I expect from my Fraxel treatment? Your clinician will apply an anaesthetic cream to your face. This will remain on for 30 minutes, while you have a tea or coffee. You may have a tingling or cool sensation on your face, which will settle into numbness. Most people who have the cream do not feel the treatment at all, or if they do, it is a slight ‘scratchy’ sensation, but not painful. Do I need anaesthetic cream with my Fraxel treatment? Modern Fraxel has been adapted to include technology that reduces the discomfort associated with the treatment in the past. This technology has meant Fraxel can be used very tolerably, without the application of anaesthetic gel for many people - particularly those who have had laser, pulsed light or peels before, find Fraxel surprisingly comfortable by comparison. For every part of the body other than the face, we do not use topical anaesthetic gel routinely, because patients do not feel they need it, but it is available should you require it. How will Fraxel work on my skin? Fraxel is a dual laser; one wavelength of the laser can target the damaged skin cells that appear as sun damage, age spots or pigmentation, while the other wavelength targets a depth of the skin that stimulates collagen production. You can have just one of these wavelengths used, or both simultaneously - that’s one of the unique benefits of Fraxel! The microscopic laser columns penetrate to the specific dermal layer dependent upon the wavelength selected by your clinician, causing strategic and rapid healing and stimulating the body’s own natural recovery process, replacing dead old cells with fresh, healthy skin. Because it leaves the tissue around the treatment columns intact, it does not cause any unnecessary or uncontrolled burning, swelling or damage. What will my skin feel and look like after Fraxel? 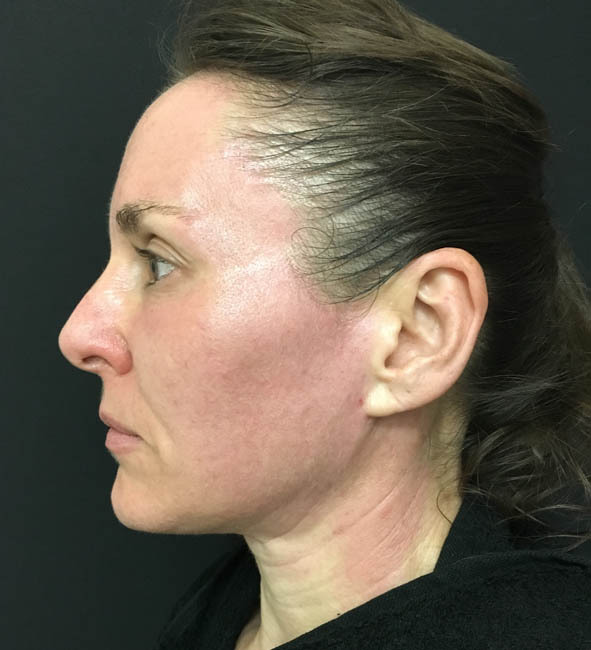 The photo on the right shows how the skin will look immediately after your treatment. The effects of your topical anaesthetic will keep your skin feeling comfortable. You may also have goosebumps or chills in the minutes after the treatment; this is a normal response and won’t last. As the anaesthetic cream wears off in the coming hours, you will feel slightly sunburned. If required, you can take over the counter pain relief for any discomfort, although most people find they do not even require this. The following day, you will see little grids of microscopic dots that show where the laser beams have treated your skin. These will gradually turn into darker, tiny dots that are often referred to as having a ‘coffee granule’ like appearance, and having a slightly sandpaper-like feeling when you run your hand across your face. Eventually these will lift off; it is important not to exfoliate or manually pull this skin off. You may also notice slight swelling and a ‘tight’ feeling; this will reduce by day 3. Using your post treatment healing balm to keep the treated area moist - and using an SPF 50 sunscreen to protect your healing skin from any exposure - is an important part of the post treatment process. You will go home from your treatment with a post-care sheet with all the information you need to optimise your results; please follow these instructions closely. How do you tell real Fraxel from the fakes? Unfortunately, Fraxel technology has become so reputable and in-demand, many ‘fake Fraxel’ machines have appeared in the market; cheaper machines that claim to be genuine Fraxel, but do not offer the safety, technology - nor meeting the rigorous regulations and laser safety standards required to acquire and operate this powerful technology. 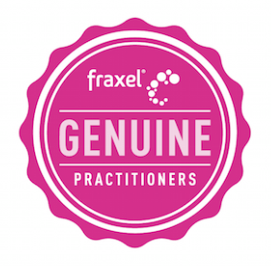 Genuine Fraxel clinics feature this logo to indicate that they offer authentic Fraxel therapy. Have more questions? Email us at info@drdavidsharp.com.au or call 3202 4744. Each member of our team has experienced Fraxel and will be able to tell you what it is like, first hand!